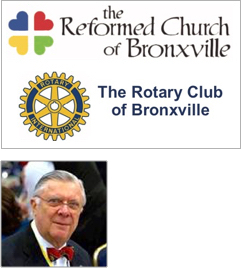 The Reformed Church of Bronxville and Rotary Club of Bronxville invite you to a dinner & auction honoring Judge George C. McKinnis. Friday May 10, 2019 at the Bronxville Field Club. See an article on the event at My Hometown Bronxville. Net proceeds of the benefit will go to The Reformed Church of Bronxville's Coming Home Program to help reduce crime and recidivism through providing support to the formerly incarcerated with individual mentoring, offering life skills and job readiness training, and providing financial support for worthy needs and projects. Cocktails at 6:00 PM. Dinner (vegan available) at 7:00 PM. Wine included. Cash bar available. We are part of a national network of 1.2 million problem-solvers. We see a world where people unite and take action to create lasting change – across the globe, in our communities, and in ourselves. For more than 110 years, Rotary's "people of action" have used their passion, energy, and intelligence to execute sustainable projects. From literacy and peace to water and health, we are always working to better our world, and we stay committed to the end. 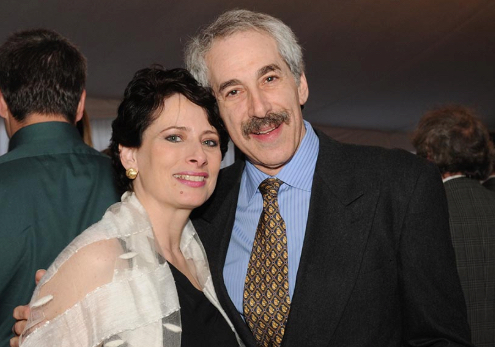 Former Bronxville resident Tania Weiss makes an excellent case for Cancer Support Team. We discovered a wonderful photo of Tania and Alan on the web site which we can't resist reproducing here. Cancer Support Team is the only Westchester based nonprofit home care program, licensed by the New York State Department of Health, providing access to essential health care services, professional nursing, social work counseling, case management and other supportive services free of charge and without regard to insurance coverage to our patients at any stage of the illness. Jennifer Cook (yes she grew up in Bronxville) changed our view of Down Syndrome. 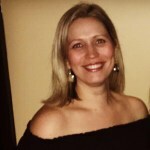 She is volunteer co-president of Gigi's Playhouse Westchester in Ardsley where exercise and educational programs improve lives for individuals with Down syndrome, their families and the community. Gigi's provides support, tutoring and exercise. Improvements in muscle tone and fine motor control can improve speech, and mobility. Training in literacy and math can maximize opportunities for daily achievement and lasting acceptance. 60% of Gigi Playhouse Westchester funding comes from their yearly Gala tickets, journal ads, sponsorships and an online auction. The gala is on March 23rd. Information is available on their web site: https://gigisplayhouse.org/westchester/gala/. Bridgette Griswold (Executive Director) gave a spirited presentation on the Groundwork Hudson Valley. The Yonkers-based organization works with community residents to restore the urban landscape, promoting long-term economic and environmental neighborhood renewal. Groundwork has uncovered polluted rivers, turned an abandoned train line into a new greenway, and transformed vacant lots into urban farms and playgrounds. 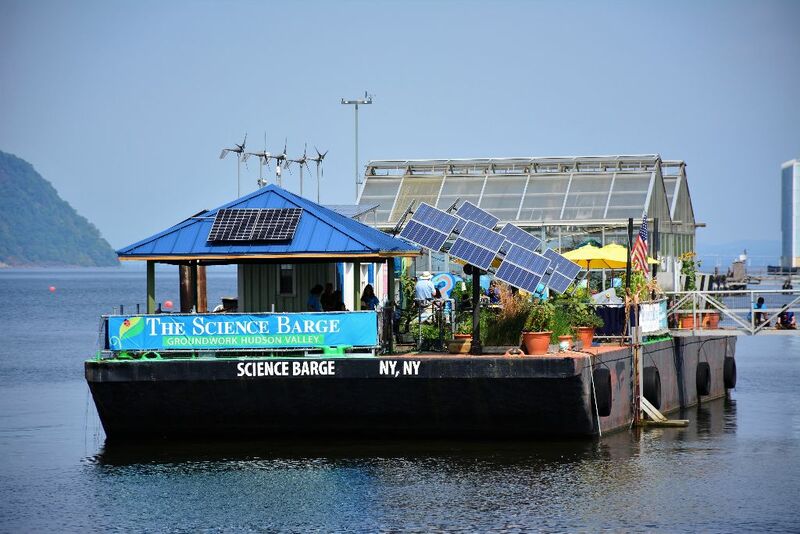 Their Science Barge is an important educational resource on the Hudson River. The National Park Service and the U.S. Fish and Wildlife Service consider Groundwork’s youth programs among the best in the nation. Groundwork Hudson Valley won the 2017 Outstanding Careers & Technical Education Partner of the Year Award from Yonkers Public Schools and the National Park Service 2016 Centennial Volunteer Challenge Award among others. Join their impressive list of major funders. Contact Sara Brody, Director of Development at sarab@groundworkhv.org. Or join the Green Team (photo below). Bronxville Rotary Club and RI International grant helps fund COMACO, a joint project with the WCS, to convert illegal wildlife poaching to legitimate businesses, harvesting honey and other products and bringing it to market. Thousands of lioves, changed by thousands of hives! Wonderful work by PP Doris and PDG Bob Benson of Bronxville New York Club, District 7230. Our 2017-18 co-recipient of funding for ongoing Literacy and Education support is Destination College. Please take a moment to view the attached video, you will recognize some very familiar faces of our Bronxville neighbors, mentoring and volunteering to assist local, neighboring student-athletes in their quest for college acceptance. This Society teaches women, who then teach five others within their village. This spreads valued education basics at a much faster rate with little or no costs, among the people suffering from the harshest levels of poverty and lack of formal education. 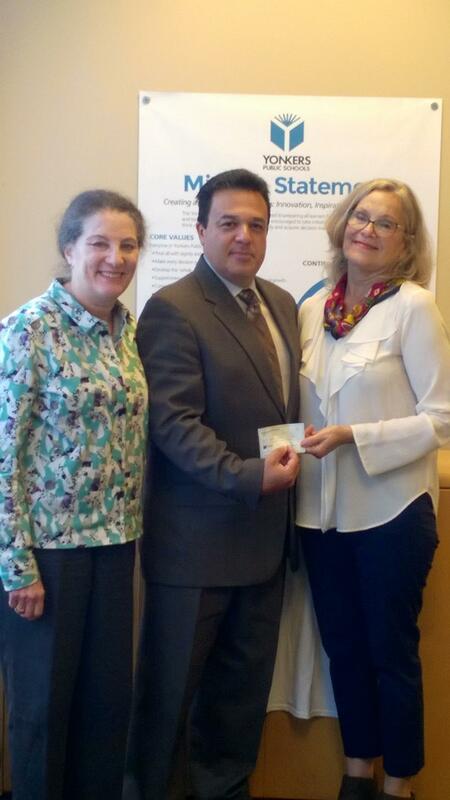 As in years past, your Club Foundation has included among its grants a small award to sponsor the Rev. Martin Luther King, Jr breakfast on the anniversary of his birth. You may know, this holiday is dedicated as a Day of Service, which dove-tails neatly with our Rotary objects of service. There is a song that was popular over 25 years ago – perhaps you remember it – a soulful song by a man named Marc Cohn; the song is called “Walking in Memphis”. It sets a scene of Memphis that the tourist board would love – the lyrics tell of the singer walking with his “feet on Beale Street, the home of the Delta Blues”. He sings of Rev. Green – Al Green of 1970’s music fame. There was catfish on the table, gospel in the air; the singer saw the ghost of Elvis up on Union Avenue – followed him up to the gates of Graceland, and saw him walk through. WC Handy. Blue suede shoes. The wide Mississippi. Several summers ago, I had the opportunity to be in Memphis. Yes, I walked on Beale Street, and, I confess, I went to Graceland. I saw the Peabody ducks march across the lobby of that grand hotel; and I saw the massive presence of Fed Ex headquarters at the Memphis airport. And I visited something not mentioned in the song. I visited The Lorraine Motel. If you’ve been there, you know that on that site has been built the National Civil Rights Museum, and it includes the motel as it looked on that fateful night in April 1968, when the Rev. Dr. Martin Luther King, Jr. with Rev. Ralph Abernathy, stayed during the Memphis Sanitationmen’s strike. Dr. King stepped out on the balcony of The Lorraine, and he stepped into history. Dr. King had preached from a pulpit in Atlanta. He had accepted a Nobel Peace Prize in Oslo. He marched from the Edmund Pettus Bridge in Selma, Alabama. He wrote a letter from the Birmingham Jail. He stood on the steps of the Lincoln Memorial, and looked out on the rows and rows of people on the Washington Mall and shared that he “had a dream”. All of those stops along the road, in 39 short years, lead to Memphis, and the balcony of The Lorraine. Walking through the Civil Rights Museum, the path takes you through all the dramatic moments of the Civil Rights movement 50 years past: Rosa Parks and the Montgomery bus boycott. The Little Rock Nine at Central High School. The lunch counter sit-in, Greensboro, North Carolina. Bull Connor’s dogs and fire hoses. Room after room after room – the stark reminders of how hard it was for human beings to receive the simple dignity and human rights every person deserves. Dignity granted by Almighty God, but denied by prejudice and hatred; years of slavery followed by years of Jim Crow. Protected by “law” in the Supreme Court, by Plessy vs. Ferguson (1896) – “separate but equal”. Lynchings and degradations done with the sanction of sheriffs and lawyers. Some churches – houses of God – that turned a blind eye, and at times, gave justification, to heinous acts of hatred. This too, was walking in Memphis. On that night in April in 1968, I was a 14 year old boy, living on the south side of Mount Vernon – the only white kid in an African American neighborhood. We had tired ourselves playing stickball earlier that day, and I was in my parents’ home on South 14th Avenue, consuming mass quantities of spaghetti, as hungry 14 year old boys do. The breaking news came on the living room TV, followed by my father’s calls to watch the unfolding story. I “understood” that my black friends would be angry over the assassination of Dr. King. I “understood” it would be dangerous for me to go back outside that night. I “understood” nothing, really, on that day. The 14 year old George Latimer could not comprehend the magnitude of the pain and suffering; the magnitude of hope Dr. King generated; the magnitude of loss being felt from Memphis to Montgomery to Mount Vernon that night. What the 14 year old George Latimer could not grasp that night, the 64 year old George Latimer can finally see clearly – seeing all the pieces put together during that walk in Memphis, leading up to the balcony of The Lorraine Motel. When those Freedom Riders boarded the buses, they did so to free blacks from Jim Crow. What they were also doing was to free White America from its shackles of prejudice. When those lunch counter protestors sat-in in Greensboro, N.C., they sat-in to assert the dignity of the black man; but in doing so they also were asserting the dignity of all men and women, for all mankind’s dignity, not just African American dignity. The dignity of Italian Americans, demeaned as wops and dagos and considered all members of crime organizations. The dignity of Irish Americans demeaned as Micks, with signs that said “Nina” – no Irish need apply. They were asserting the dignity of those who are Jewish, those who are Native American, those who are Asian, those who are Hispanic, those who are Catholics and those who are Buddhists, and those who are Muslims and those who fall within any number of demographic descriptions. The march from Selma to Montgomery asserted the right of black men and women to vote – to select their leaders – to govern themselves, but by doing so, they asserted that right for all men and women. I heard, in the days after Dr. King’s assassination, a voice on the radio of the man who was our then-U.S. Senator from New York; he said “no one can be certain who next will suffer from some senseless act of bloodshed.” In the next 60 days, we found out who did in fact suffer next; that voice belonged to Sen. Robert F. Kennedy. And yet, the violence of those days did not deter the dream. We are here tonight remembering the life of Dr. King, not his death. But he was not just a dreamer – he was a doer. The bravery he showed, in the face of constant physical threats, is a model for all of us; to show bravery in standing up for beliefs and principles, even if they are unpopular. Especially if they are unpopular. Dr. King preached non-violence, but he did not preach passivity and timidity. He dreamt that there would be a better day for all of us, but he worked every day of his life to achieve that better day, knowing that good works and faith go hand in hand. For those of us in the Christian faith, as joyous as Christmas time is – the birth of Christ – the greater celebration is the rising of Christ after his crucifixion, his triumph over death that we celebrate at Easter. The ideas and the dreams of Dr. King have triumphed over his death. They have triumphed over those who set fire to the Freedom Rider buses; they have triumphed over those who taunted the Little Rock Nine, and triumphed over those who stood in the school house door at Ole Miss and Alabama. The ideas have triumphed over Bull Connor’s dogs, and over those who placed the firebomb in the church on Sixteenth Street that killed little girls in 1963. Rosa Parks now has her seat -- in heaven. And we here on Earth must continue forward to complete the unfinished business of Dr. King’s legacy. Put on my blue suede shoes, and I boarded the plane. Touched down in the land of the delta blues / in the middle of the pouring rain. Board meetings start at 11:00AM SHARP! Please consult our club Rotagram for upcoming dates. Our meetings are lively exchanges of ideas and our agenda includes the projects which currently are active, and future planning.